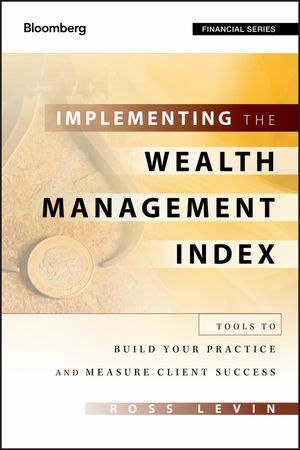 From Ross Levin, a trusted financial planner, comes Implementing the Wealth Management Index. The new edition of the book Investment Advisor called a "landmark opus," this revised and updated volume expands upon his legendary Wealth Management Index tool. A benchmark system that, through a series of questions and evaluations, enables advisors to score their performance for individual clients, the tool is used by firms around the world. In this new edition, the index looks at asset protection, disability and income protection, debt management, investment planning, and estate planning. The new edition adds more how-to information, as well as actual client examples and case studies to show how Levin's firm successfully uses the index as a daily strategy. Asks the important questions, like "Did you use all reasonable means to reduce your taxes?" and "Have you established and funded all the necessary trusts? Have you made your desired gifts for this year? Essential guidance from a top man in the game, Implementing the Wealth Management Index is the one-stop resource for measuring client financial progress. ROSS LEVIN, CFP®, is the Founding Principal and President of Accredited Investors Inc., and a nationally recognized expert in financial planning. He was named one of the five most influential people in financial planning by Financial Planning magazine and as one of the twenty-five most influential individuals in and around the advisory profession by Investment Advisor magazine. A much sought after speaker on financial matters, Levin has appeared in numerous publications, including the Wall Street Journal, Bloomberg Businessweek, Fortune, the New York Times, Newsweek, Barron's, and Money magazine, as well as on television and radio shows such as NBC Nightly News, The Oprah Winfrey Show, and American Public Media's Marketplace Money. Levin was the first recipient of the Financial Planning Association's Heart of Financial Planning Award. Medical, Long- Term Care, Property/Casualty, and Personal or Professional Liability Issues? and the Evaluation of What Success Looks Like?